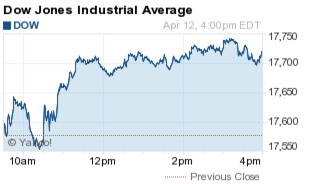 What gave the Dow Jones Industrial Average its best one-day gain in a month today? Oil, oil… and more oil. With a global deal likely in place to freeze production, traders are turning their attention to earnings reports for the March-ending quarter. Despite concerns that the first quarter could be the worst for earnings in years, investors are growing more optimistic that a surge in oil prices could rally the markets and provide buying opportunities for firms exposed to depressed prices over the last year. Here's what else you need to know about the markets on Tuesday, April 12, 2016. WTI crude oil prices hit a 2016 high, rallying 4.5% to $42.17, on news Russia and Saudi Arabia have agreed to freeze output levels ahead of next week's meeting among global producers in Doha, Qatar. This announcement is critical because it indicates that any deal including additional producers will not be contingent on whether Iran decides to join the accord. In recent weeks, Iran's oil minister has said the country will not participate in a freeze as it brings oil back to the market after years of being frozen out by global economic sanctions. Brent gained 4.3% to $44.69 on the day. Here's what to expect for oil prices moving forward in 2016. Oil also received a boost after John Watson, chairman and CEO of Chevron Corp. (NYSE: CVX), said in an interview with CNBC that oil markets will balance out in the coming months. Watson expects cuts to capital investment will lead to a decline in global supply, bringing the market to equilibrium. Shares of CVX stock were up 2.4% on the day. The International Monetary Fund argued in a report released today that an exit by the United Kingdom (Brexit) from the European Union could destabilize global markets. The global financial agency is concerned companies will not be able to quickly transition to the new economies and reality of business in Europe. The statement came after the IMF slashed its global growth forecast for the fourth time in 12 months. It now projects a global growth rate of 3.2% for 2016. Analysts anticipate that a Brexit could significantly affect global confidence. The IMF also raised concerns about the economies of China, Japan, Brazil, and the European Union. However, keep in mind we are going to use such events to find new opportunities to buy into the markets in the long term, regardless of whether the United Kingdom exits or not. But the big news today was the performance of financial stocks. With major banks reporting earnings this week, traders set aside concerns about a downturn in the sector and pushed the stocks higher. The SPDR S&P Bank ETF (NYSE Arca: KBE) rallied 2.1% today. Tomorrow, JPMorgan Chase & Co. (NYSE: JPM) kicks off the bank earnings party by reporting its fiscal first-quarter report. It was a brutal day of downgrades for stocks across the markets. Shares of Starbucks Corp. (Nasdaq: SBUX) fell 2.3% after an analyst at Deutsche Bank AG (NYSE: DB) raised concerns about changes to the firm's loyalty program. Goldman Sachs Group Inc. (NYSE: GS) downgraded L Brands Inc. (NYSE: LB) over concerns related to a restructuring of its Victoria's Secret business. Finally, investment firm Piper Jaffray downgraded Avon Products Inc. (NYSE: AVP) on valuation concerns. AVP stock still gained 3.3% today. This is a heck of a story. Shares of Fannie Mae (OTCMKTS: FNMA) and Freddie Mac (OTCMKTS: FMCC) rallied 34% and 29.8%, respectively, on news that the federal government knew the companies were sustainable as they continued to "sweep" profits from the firm. The government amended both companies' bailout terms to send all of their future profits to the U.S. Treasury. That has prompted several lawsuits from shareholders, who argue that the government takeover of private property has failed to offer due compensation. Who knew that the government would be deceitful? Earnings season is upon us. Shares of Alcoa Inc. (NYSE: AA) fell 2.7% after the aluminum giant missed earnings expectations yesterday after the bell. Shares of Chesapeake Energy Corp. (NYSE: CHK) surged 34.4% – that makes it the biggest gainer in the energy sector today. On the earnings front, shares of Juniper Networks Inc. (NYSE: JNPR) fell 7.4% after the firm's quarterly profit and revenue figures slipped below analysts' expectations. Finally, yesterday, Hillary Clinton was favored by 29 points over Donald Trump in a general election, according to an NBC/WSJ/Marist poll. So, we wanted to clue you in on the best stock to buy now if Hillary Clinton becomes president. Our pick will surprise you.